Yume Kōjō: Doki Doki Panic (lit. "Dream Factory: Heart-Pounding Panic") is a 1987 platform game released for the Family Computer Disk System about a family who plans to rescue two children. "Doki doki" is a Japanese onomatopoeia for a rapidly beating heart, and it is commonly found in Japanese video game titles, carrying connotations of excitement and anxiety. The game is known for its Western conversion in 1988 as Super Mario Bros. 2 for the NES which had its characters changed to those from Nintendo's Super Mario Bros. The western version of Super Mario Bros. 2 was also released in Japan for the Nintendo Famicom as Super Mario USA. 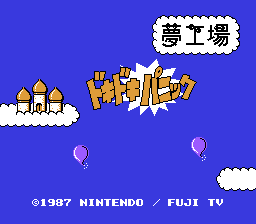 The game was developed in cooperation with Fuji Television to promote its Yume Kōjō '87 (tr. Dream Factory '87) event, which showcased several of Fuji TV's latest TV shows and other products at the time. The game featured the mascots of the Yume Kōjō festival — a family consisting of siblings Imajin and Lina and their parents, Papa and Mama — as its main characters. 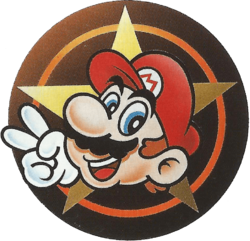 The rest of the characters, including the main villain, Mamu (known as Wart when localized for Super Mario Bros. 2), were all creations by Nintendo for the game. The game takes place within a book with an Arabian setting. All four characters are playable, and the game is not fully completed until the player plays through as all four. Even though it was not originally conceived as a Mario game, Shigeru Miyamoto had a larger involvement in this game than he did with the original Super Mario Bros. 2 (known outside Japan as The Lost Levels) which was released in Japan. Some elements from the Mario universe already existed in Doki Doki Panic, such as the Starman, coin and jumping sound effects, the POW blocks and level warping. Also, the game's soundtrack was already composed by Kōji Kondō, the original Super Mario composer, and upon the conversion needed only a few alterations such as removing most of the Arabian elements, replacing them with original Super Mario tunes. In 1988, the game was localized for North America, Europe and Australia as Super Mario Bros. 2. The Yume Kōjō family members were replaced by Mario, Luigi, Princess Toadstool, and Toad, and numerous other small changes were made, such as the B Button on the NES controller making the characters run. Yume Kōjō: Doki Doki Panic represents the original source of several elements that later became common in the Mario series, such as characters Birdo and Shy Guy. By in large, the gameplay from Doki Doki Panic to Super Mario Bros. 2 remains unchanged. There are only a few differences between the two games as far as gameplay is concerned. The Doki Doki Panic character selection screen. 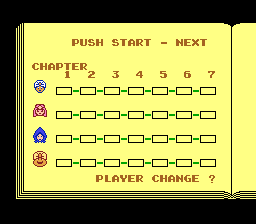 Character selection: In Doki Doki Panic, you can still choose from among four characters, but each character's progress through the game is tracked independently. While each character can beat the game, you will not witness the true ending of the game until all four characters have completed the game. While you can change characters at any point after you die, the next character you choose can only continue from the furthest point in the game that they have completed. Game saving: Because Doki Doki Panic was released on disk format, your progress through the game could be written and saved on the disk. Since you have to play through the game four times, once with every character, in order to see the true ending, saves were a must so that you were not required to play the entire game four times without shutting the machine off. No running: In Doki Doki Panic, is used for nothing more than picking up object or enemies, and throwing them. Holding down will not make your character accelerate. This was only added to Super Mario Bros. 2 because B-button running was such a popular feature of Super Mario Bros.
No shrinking: While primarily a cosmetic alteration, the characters of Doki Doki Panic have no "small mode" like the characters in Super Mario Bros. 2 do. Therefore, when you are reduced to one health point, you will not shrink, and when you gain a second health point, you do not grow. A new boss: In Doki Doki Panic, you will face Mouser not twice, but three times in the game. In Super Mario Bros. 2, the third Mouser was replaced by a new boss, Clawgrip, who was designed exclusively for the western release of the game. In contrast to the gameplay, a lot of things about the way that Doki Doki Panic looked and sounded were altered in the transition to Super Mario Bros. 2. The following is a list of features that were changed. In Doki Doki Panic, it was the young son named Imajin who was the average character, neither strongest or weakest in any particular way. He was selected to become Mario in the western conversion of the game. The tall mother was the high jumper of the family in Doki Doki Panic. She was chosen to be converted to Luigi, perhaps as a nod to his jumping abilities in the Japanese version of Super Mario Bros. 2. Luigi was the higher jumper of the brothers in that game as well. Imajin's sister, Lina, inherited some amazing jumping abilities from her mother. However, instead of jumping high, she could jump very far. She was a natural choice for the conversion to Princess Toadstool, who can apply her pose and royal grace to her gravity-defying leaps. Although he has a face which closely resembles Mario, the stature and dress of the father more closely resembles Toad. And so the father of the Doki Doki Panic family was converted to Toad, and Toad inherited the father's great strength and speed. Although both games featured a Bonus Chance game, where you could spend the coins that you collected from Sub-space on a slots-like game in order to earn extra lives, the look and layout of the bonus in Doki Doki Panic was much simpler. It was made more elaborate and made to look similar to the title screen of Super Mario Bros. 2. In Doki Doki Panic, the dark grass lay on the ground, still and lifeless. In the western conversion of the game, the grass color was lightened to a brighter red color to make it stand out from the background, and it was animated with a slight breeze softly blowing the blades about. 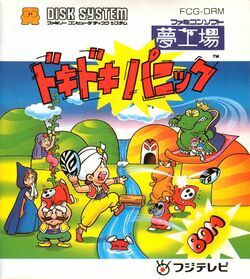 Fitting in with Doki Doki Panic's Arabian theme, the entrance to Sub-space was granted by discovering and tossing a Magic Lamp on the ground. Rubbing the lamp won't cause a genie to arrive, but the door that appears functions the same as the door which is conjured by the magic potions that Mario and crew discover. Just like in The Legend of Zelda, the characters' life meters in Doki Doki Panic are increased by collecting Heart Containers. Since the western conversion was chosen to be a Super Mario Bros. game, it was thought that Mushrooms should play a role somehow, so the Hearts were replaced with Mushrooms. In Doki Doki Panic, some of the grass that the players lifted was not grass… it was hair. The hair of a disembodied head that was buried in the ground. When tossed to the ground, it glided along the surface knocking out every enemy that it came in contact with. This behavior was coincidentally similar to another item in the Super Mario Bros. universe; the Koopa turtle shell. The gates which separated one world from the next had a different visual appearance in Doki Doki Panic. They were far more artistic and stylized. For Super Mario Bros. 2, they were redesigned and redrawn to resemble the faces of hawks. In the Japanese version, the explosions created by bombs were accompanied with the letters "BOM" as a means of indicating the loud explosion sound that occurred. Afraid that players might not understand the significance of this non-word, Nintendo added a "B" the end of the word, to make it spell "BOMB" so that there could be no misunderstanding. The key guardian Phanto of Doki Doki Panic looked a little less sinister than the Phanto that western players are familiar with. In addition to the more serene face, Phanto does not shake and come to life as soon as a player collects a key in Doki Doki Panic. He does not come to life and attack until the player returns to the main portion of the map. While this may seem like Doki Doki Panic players have an advantage, the lack of the "B-button Run" ability made Phanto a lot harder to escape. 1-Ups: In Doki Doki Panic, when a player uproots a 1-Up from the ground, they appear as the face of the player in question. In Super Mario Bros. 2, this was changed to a singular 1-Up mushroom that is identical for everyone. Mushroom Blocks: The Mushroom Blocks of Super Mario Bros. 2 did not originally resemble mushrooms at all. Or blocks for that matter. They were a series of masks that the players would pick up and toss around. Albatoss animation: In Doki Doki Panic, the wing flap of the Albatoss was only animated across two frames. Several in-between frames were added in the western conversion to give Albatoss the far smoother animation that he has today. Ambient animation: In addition to the animation of the grass explained in the table above, several other animated objects from Super Mario Bros. 2 were motionless in Doki Doki Panic. This includes the leaves on the vines, the cherries, POW blocks, bomb fuses, and the surface of water. On the other hand, many of the waterfalls in the game animated at a much faster rate in Doki Doki Panic, and were slowed down for the western release. Sounds were also altered from the original version to the western release. Doki Doki Panic had shorter scores for the character select music and the overworld theme. Sub-space and invincibility music was entirely different. 1-Ups originally made the same noise upon completing a level. This was changed to the traditional extra life noise from Super Mario Bros.
Several things generate different noises, including enemies when they are picked up and thrown, Birdo, Rockets, POW blocks, collecting cherries, potions/lamps, entering a door, gates opening, getting hit, whale spouts, and StopWatches. This page was last edited on 15 July 2015, at 15:46.